While the concept of the aeroponic system is quite simple, it’s actually the most technical of all 6 types of hydroponic systems. However it’s still fairly easy to build your own basic aeroponic system, and a lot of home growers like growing in them as well, and even get really good results using this type of hydroponic system. However there are a few downsides to aeroponic systems as well. Besides being a bit more expensive to build. The mister/sprinkler heads can clog from build up of the dissolved mineral elements in the nutrient solution. So make sure to have extras on hand to swap out when they do clog while you clean them. Also because the plants roots are hanging in mid air by design in aeroponic systems, the plants roots are much more vulnerable to drying out if there is any interruption in the watering cycle. Therefor, even any temporary power outage (for any reason) could cause your plants to die much more quickly than any other type of hydroponic system. Also there’s a reduced margin for error with the nutrient levels in aeroponic systems, especially the true high pressure systems. The growing chamber the roots are in should be light proof, and almost air tight. It does need to allow fresh air in so the roots can get plenty of oxygen, but you don’t want water to spill out, or pests to get in. Also you want the root chamber to hold in humidity. Ultimately what you want is the roots to get plenty of moisture, fresh oxygen, and nutrients. A a well designed aeroponics system provides a good balance of all three of those elements to the roots at the same time. Also termed “soakaponics” low pressure aeroponic systems are what most people are familiar with when they think of aeroponics. That’s mainly because most all aeroponic systems sold at stores selling hydroponics supply’s are low pressure systems. While the low pressure systems work very nicely, the large water droplet size is much different than in the high pressure systems. The main reason the low pressure aeroponic systems are so popular is that they don’t require much more in the way of cost or special equipment than other types of hydroponic systems. The simplicity and low cost of low pressure systems makes this type of aeroponic system very attractive to many home growers. While you don’t need any special equipment or a special water pump. The standard fountain/pond pumps will do just fine. You do however want a pump that’s stronger than you would for any other type of hydroponic system. That’s the main and most important difference. That’s because the pressure in the system will drop some with each sprinkler head you add. Fountain and pond pumps don’t give a psi (pressure) rating, but the more GPH (gallons per hour) it can put out closer to the “max head height” the stronger (more pressure) the pump has. You will want enough sprinkler heads that the spray overlaps, and completely covers the entire root zone. Even as the plants get bigger and the root mass gets bigger. As the root mass gets big, it’s often hard for the spray from the sprinkler heads to penetrate the thick root mass. If you design your low pressure aeroponic system so the roots are sprayed from above the root mass or near the top of it, the water will trickle down through the root mass much better than trying to spray them from below. While the low pressure systems are the most common, high pressure aeroponic systems are the “true aeroponic” systems. That’s because it takes the higher pressure (60-90 psi) to properly atomize the water into a fine mist with a very small water droplet size. This fine mist allows the roots to get a lot more oxygen than in low pressure systems. However it’s more complicated and expensive to build a high pressure aeroponic system. Accumulator tank (to act as the pressurized reservoir tank). Solenoid valve (to open and close the feed line to the mister heads). Cycle timer (to open and close the solenoid valve). Fine spray mister heads (to spray the roots with a fine mist). Small air compressor (to pressurize the accumulator tank). A collection reservoir to collect the runoff if you plan to recirculate the nutrient solution. While the basic design of the growing chamber and plant support can remain the same as with low pressure systems. The water (nutrient solution) delivery system is much different. Because of how often a pump would need to turn on and off (100’s to 1,000’s of times a day) it would ware out very quickly. So the water pump is eliminated in high pressure aeroponic systems. To do that they pressurize the reservoir. The easiest way to do that is by using an accumulator tank similar to the type used in RO (reverse osmosis) water systems. It’s basically nothing more than a tank with a rubber divider/diaphragm in the center, creating two sides. Water (nutrient solutions) goes in one side, and compressed air goes in the other. The air is filled until the pressure reaches about 60 to 90 psi. That pressure pushes against the rubber diaphragm and pressurizes the reservoir side with the nutrient solution in it to the same psi. A water line runs from the reservoir to the mister heads in the enclosed growing chamber to mist the roots. A Solenoid valve is used to open and close the water flow through the line to the mister heads. The Solenoid valve open and close timing is controlled by a cycle timer. The cycle timer can open and close the Solenoid for as little as one second, to as long as the grower wants. Typically it’s open/on for just a few seconds at a time, and off for only minutes before it sprays again. The cycle timer opens and closes the solenoid watering the plants roots with mist on this type of “on/off cycle” all day long. 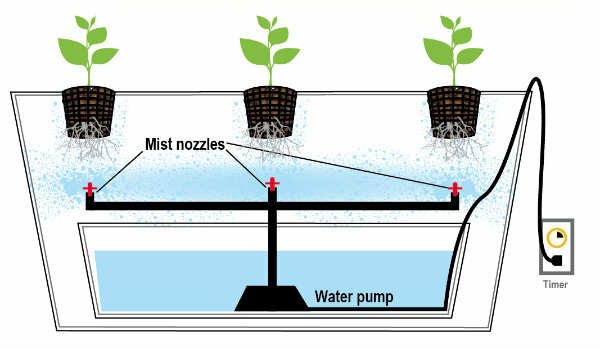 Ultrasonic fogger have also been used to create a mist in aeroponic systems, however with mixed results. Ultrasonic fogger are most commonly used to create visual displays in ponds, as well as on stage. They are also often sold around Halloween with the Halloween decorations too. While they do create a mist with a very small water droplet size, there is very little actual moisture in the mist/fog. The mist created from ultrasonic foggers also tends to drop to the bottom of the container. Making it hard to make sure the roots are completely covered by the mist all the time. Another issue with using fogger is that the plates tend to clog with mineral build up. The only plates that have shown to work with any reliability are the more expensive Teflon heads. They can sometimes be cleaned using white vinegar, or water and pH down, and wiping them off with a Q-tip. Some growers have combined using ultrasonic foggers along with the low pressure aeroponic design in the same system.